Happy St. Patrick’s Day!!! Though I’m not Irish (100% Greek here! ), I still have fun celebrating. 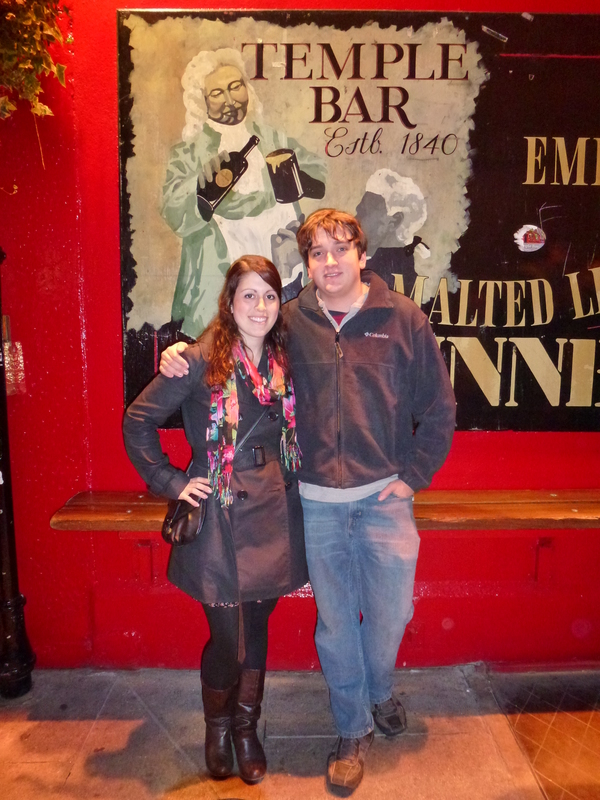 Plus when I visited Ireland, everyone I met was very friendly and welcoming so I can’t help but love the culture. Also I happen to live next to an Irish pub and hotel so it’s hard not to join in on the celebration! Unfortunately, my recipe for you today is not remotely Irish (due to my poor planning)… but you are still going to love it! First, I want to update you on the Sophomore retreat I chaperoned on Thursday and Friday. It was wonderful! I’m not going to go into too much detail, but the students were really well-behaved and I was really impressed with their insights and thoughtfulness. Overall it was a really great experience and I’m happy I volunteered. I also had a nice, relaxing weekend which made me well-rested for today. We had staff development today at school so we actually finished at 1 pm which was really nice because it’s not often we get out early! I am definitely enjoying my extra free time. First, you will need to prepare the rice. 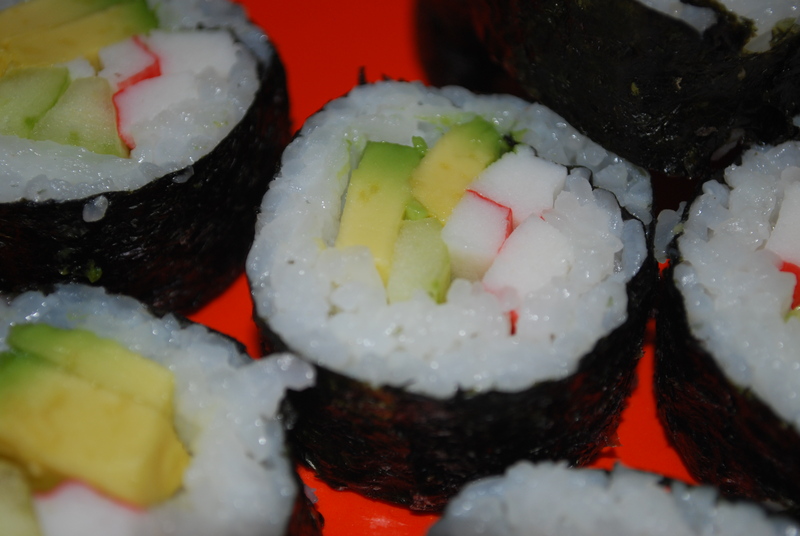 You should buy “Sushi Rice” which is a specific type of rice that sticks together really well. 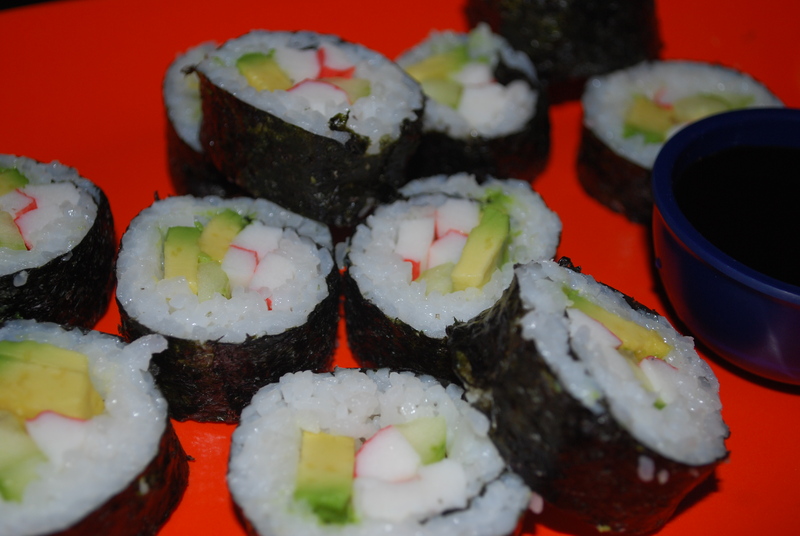 You can get it at most grocery stores and it will say sushi rice on it. Cook 1 1/2 cups rice according to the package directions and once it’s cooked, move it into a bowl. 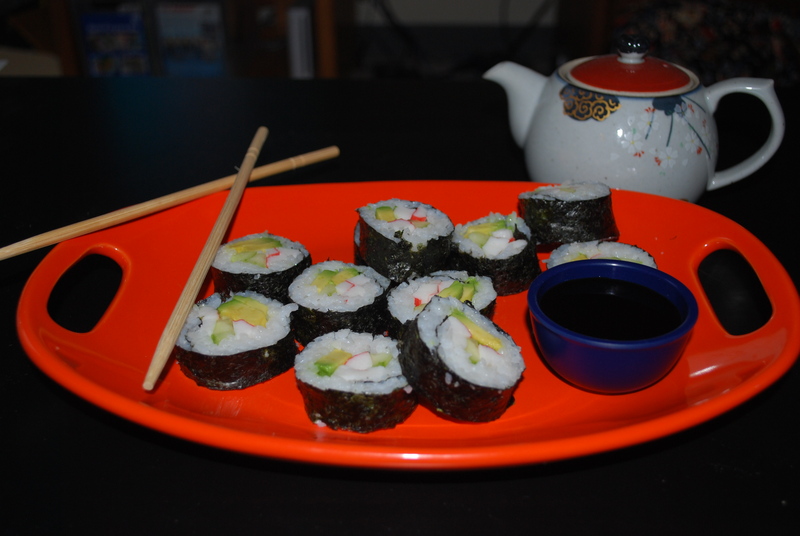 With 1 1/2 cups rice, I made 4 rolls. In a different bowl, combine 2 tablespoons rice vinegar, 2 tablespoons sugar, and a dash of salt. Heat it up in the microwave for about 15-20 seconds then stir into the hot rice. While the rice is cooking, you can prepare the rest of your ingredients. 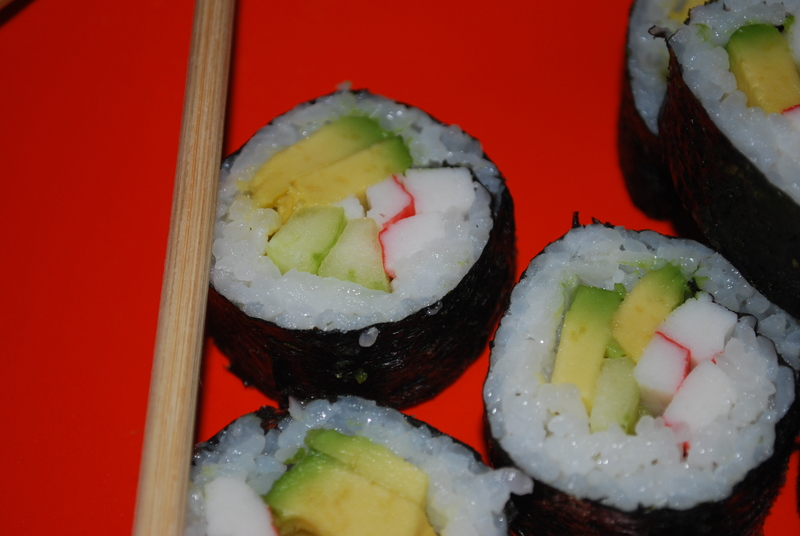 For California Rolls, you will need cucumber, avocado, and crab sticks (or real crab if you prefer). 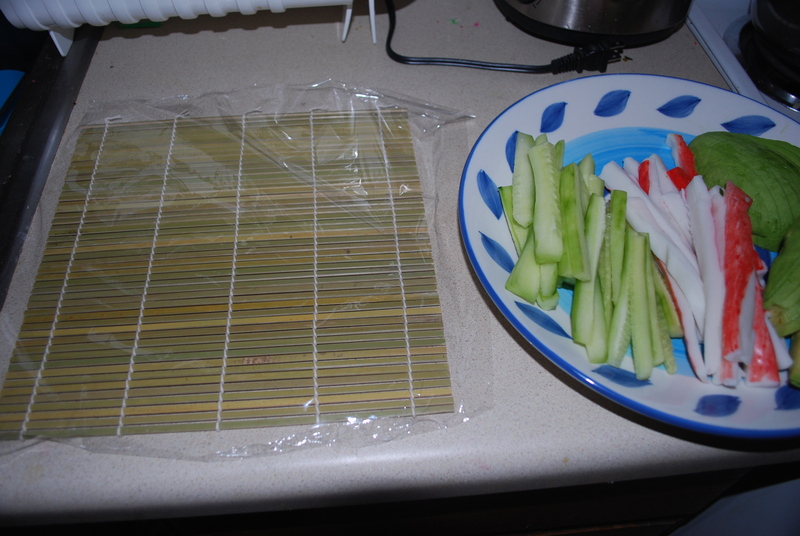 Cut them into strips and set aside. 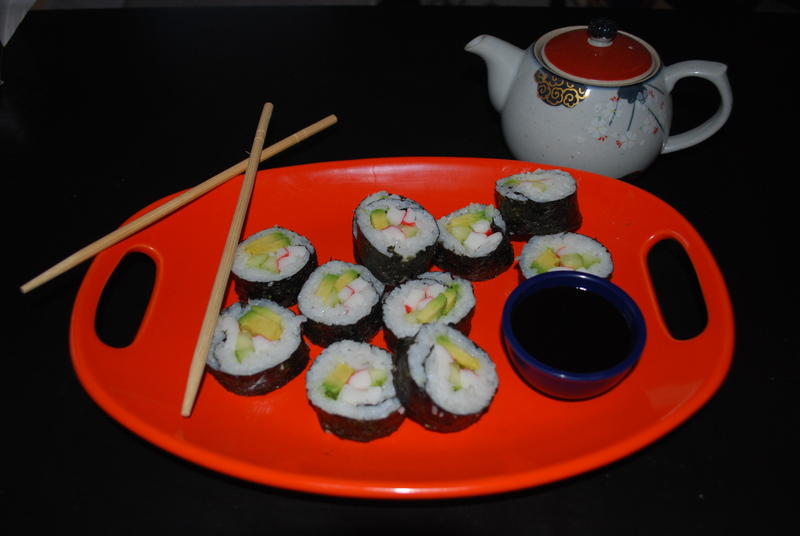 How many you use is up to you – I used about 1/2 a cucumber, 3 crab sticks, and 1/2 an avocado and made 4 rolls. 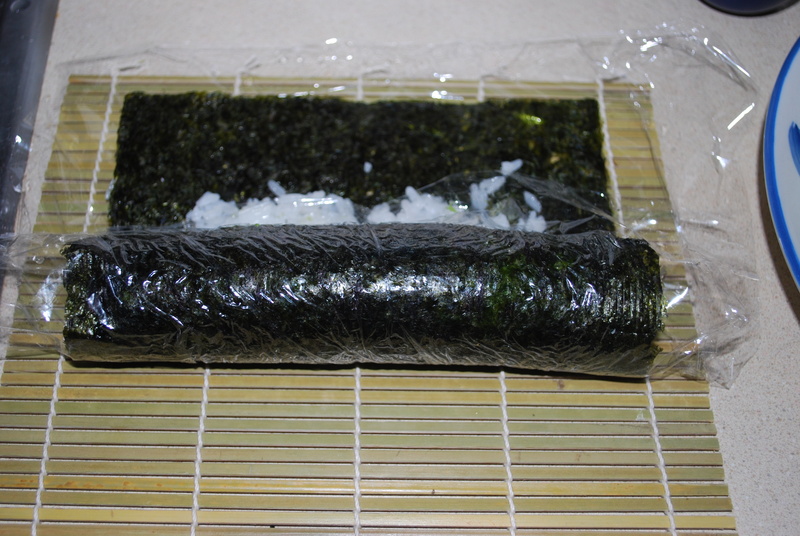 Once your rice is cool and your ingredients are ready, you can start rolling. 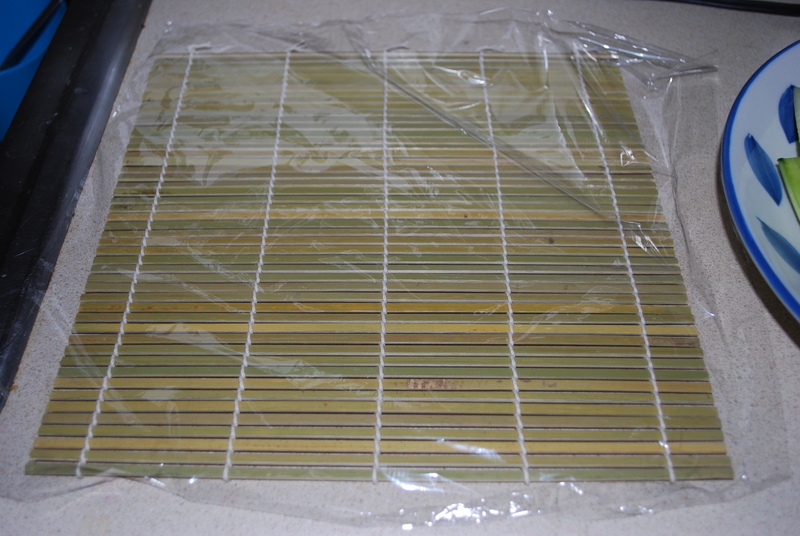 If you have a sushi mat, lay it out on the counter and cover it with plastic wrap. 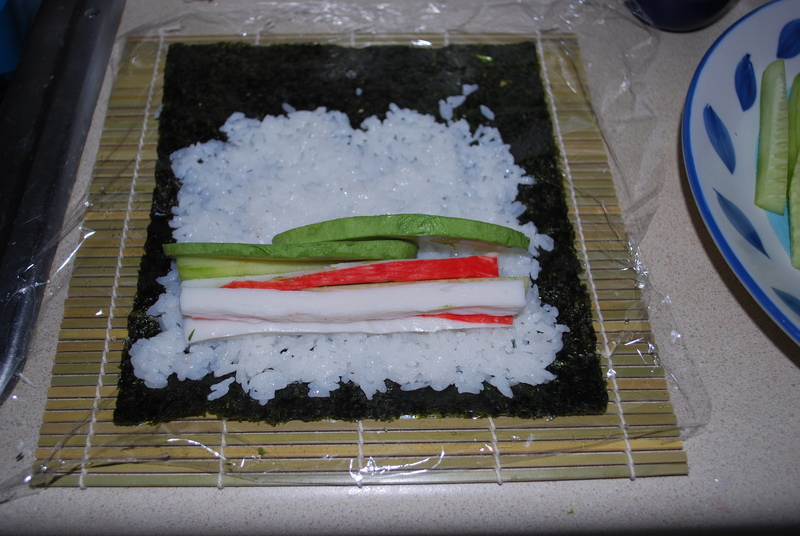 A sushi mat is not necessary, it just makes rolling the sushi easier. 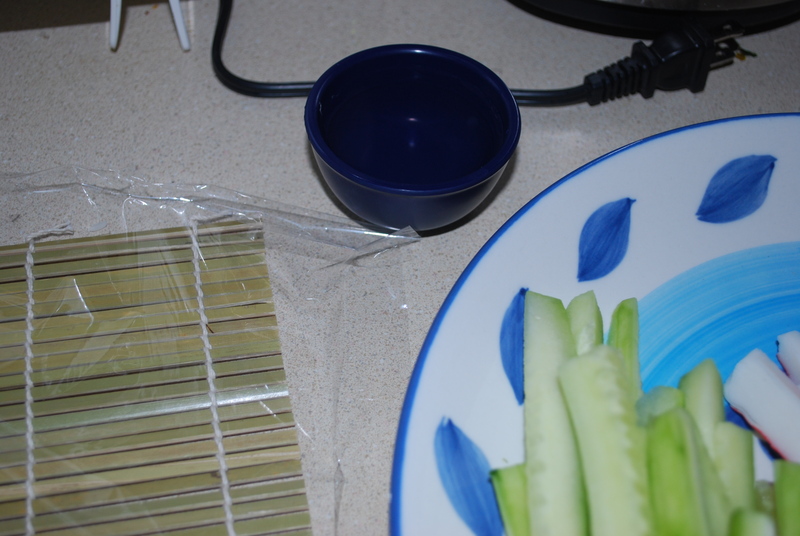 You should also fill a little bowl with warm water to wet your fingers and hands to keep the rice from sticking to them. 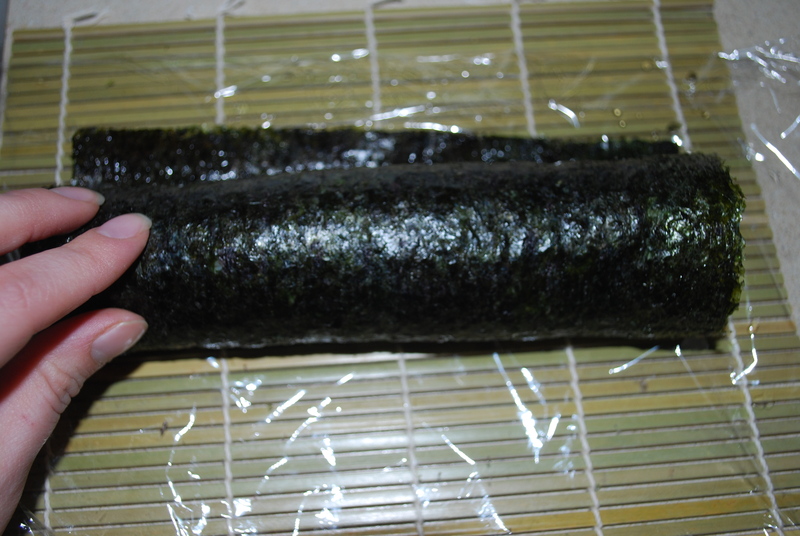 You will also need it to seal the seaweed at the end of the rolls. 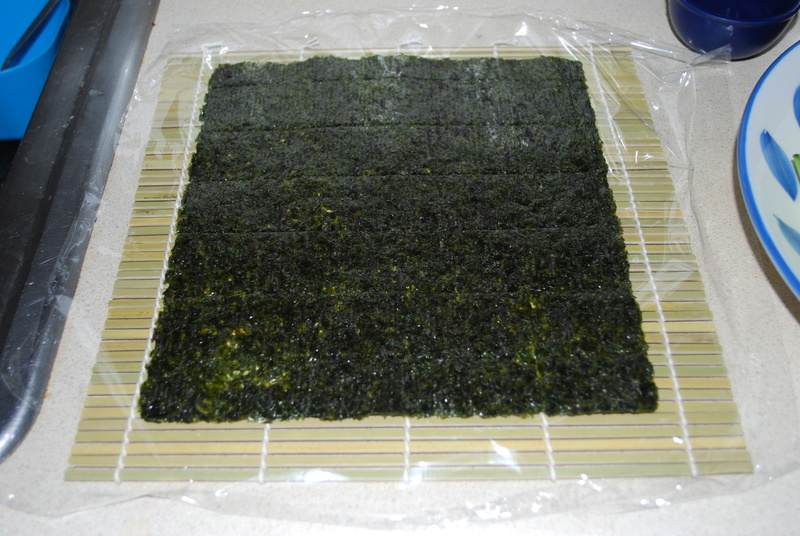 Next place the nori (seaweed) on the sushi mat. 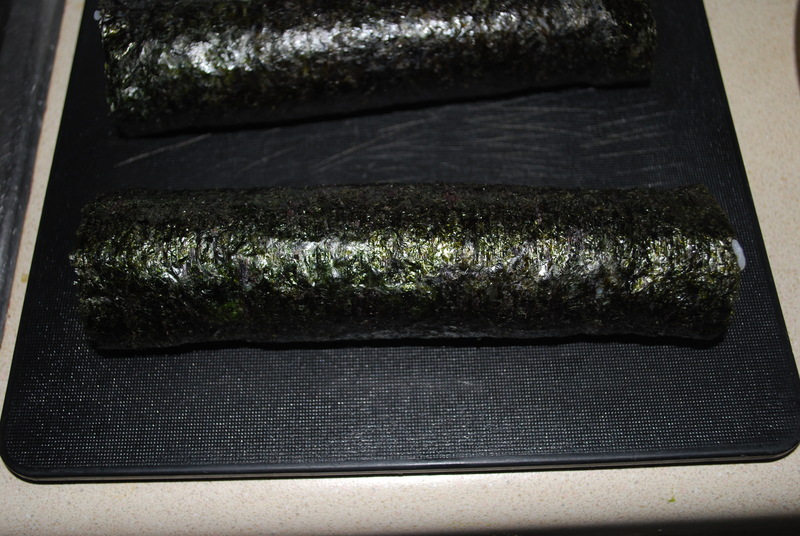 I got my nori from a Japanese supermarket, but I’ve seen it at Whole Foods and other grocery stores. 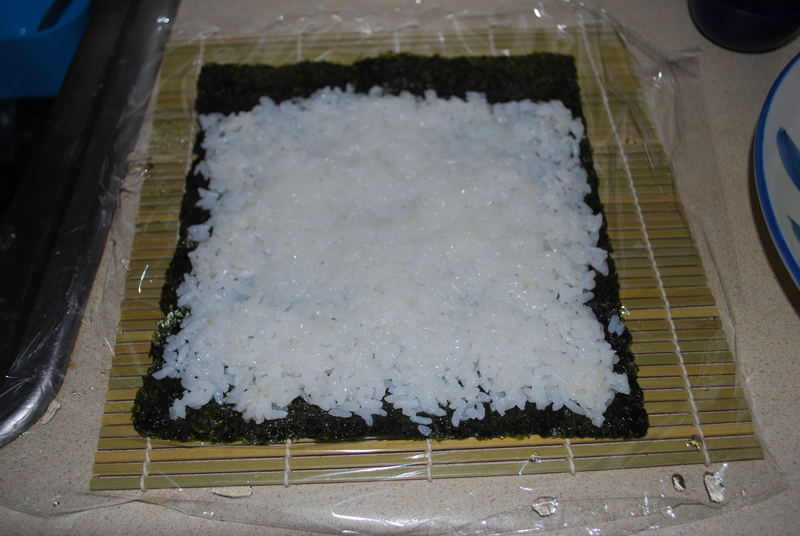 Take about 1 cup of rice and spread it evenly across the seaweed, leaving about an inch uncovered at the top. 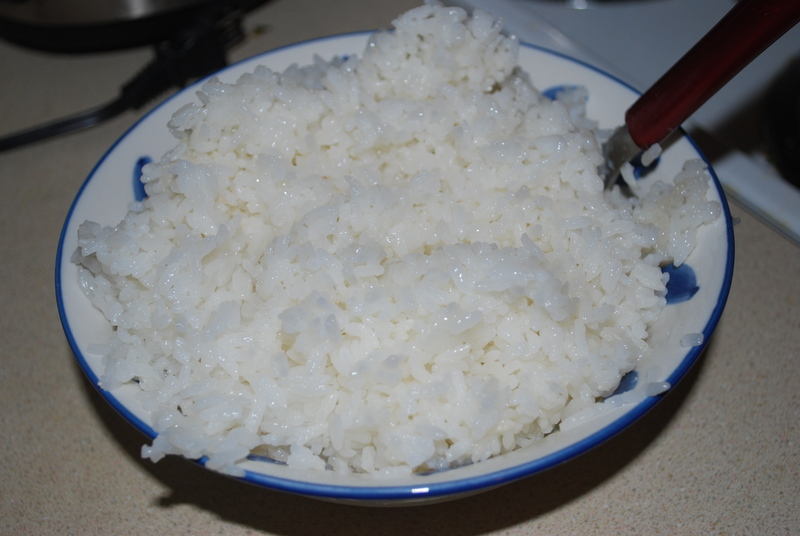 You’ll want to wet your hands with warm water before you do this so the rice doesn’t stick to your hands. 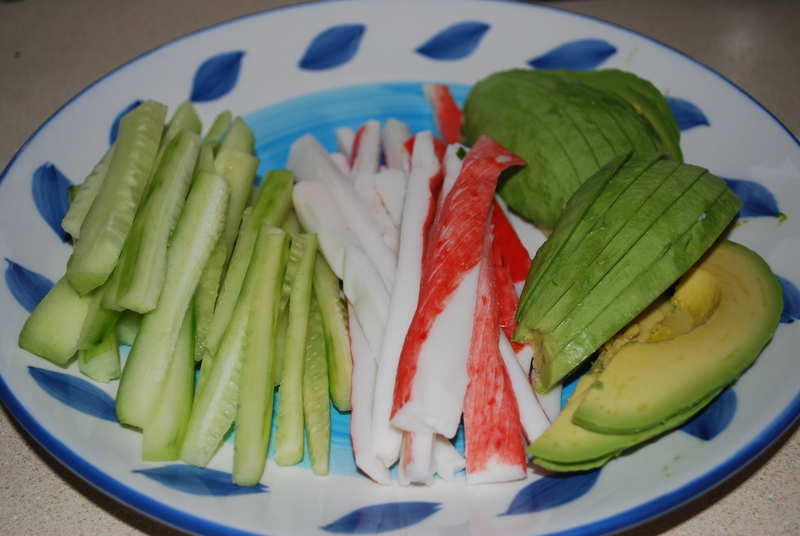 Place 2 strips of cucumber, crab, and avocado on the bottom third of the seaweed. 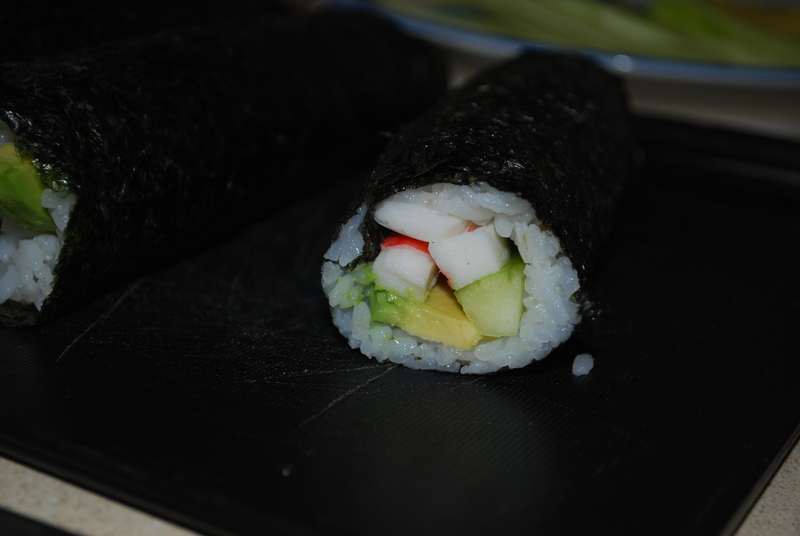 Now, begin to roll the sushi. 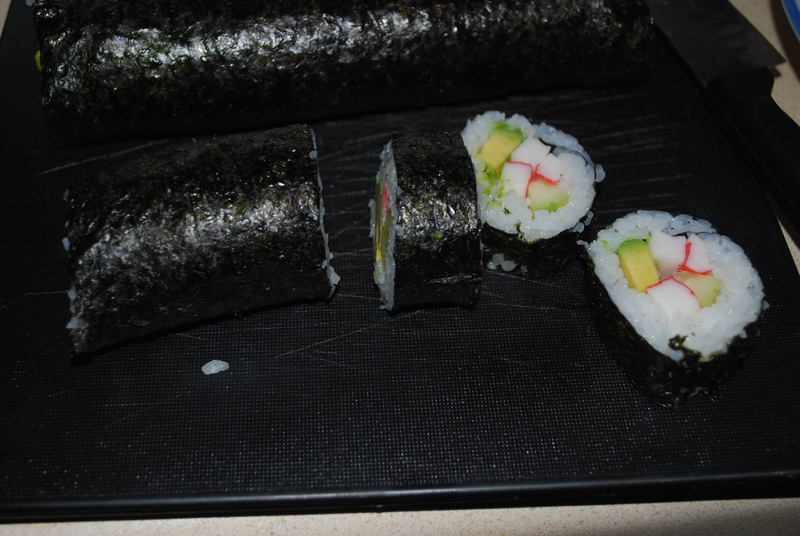 Use the sushi mat to make one complete roll, tightening it to make sure that the filling inside is tight. 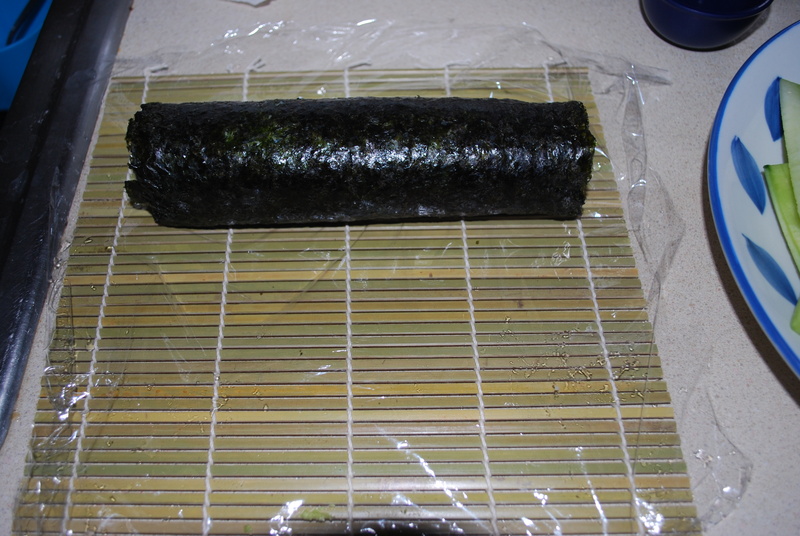 Hold on to the mat and the plastic wrap and continue rolling the mat until you get to the end of the seaweed. 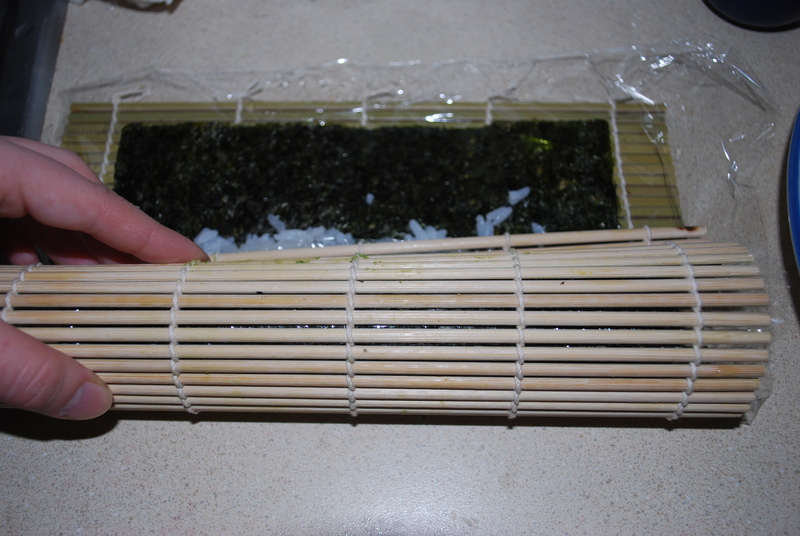 Use your finger to wet the edge of the nori that is not covered with rice then make one final roll to seal it. 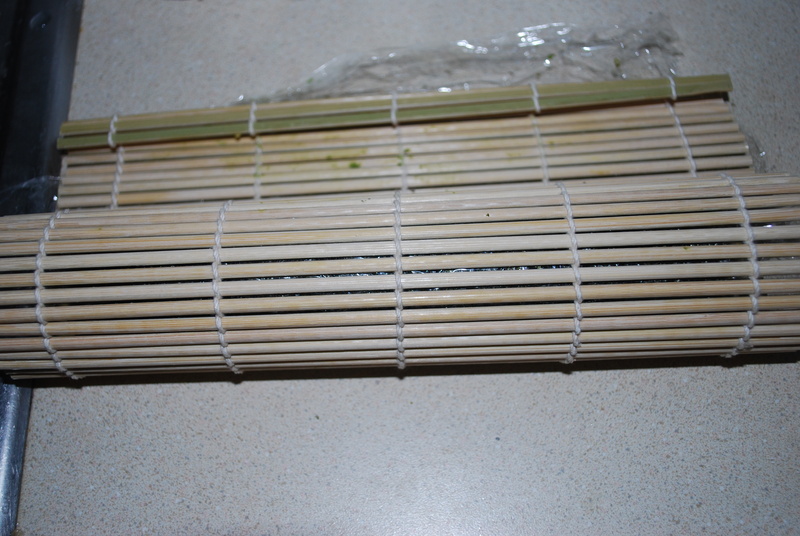 Once your roll is finished, cut off the edges and use a sharp knife to slice it into 1/2″ pieces. 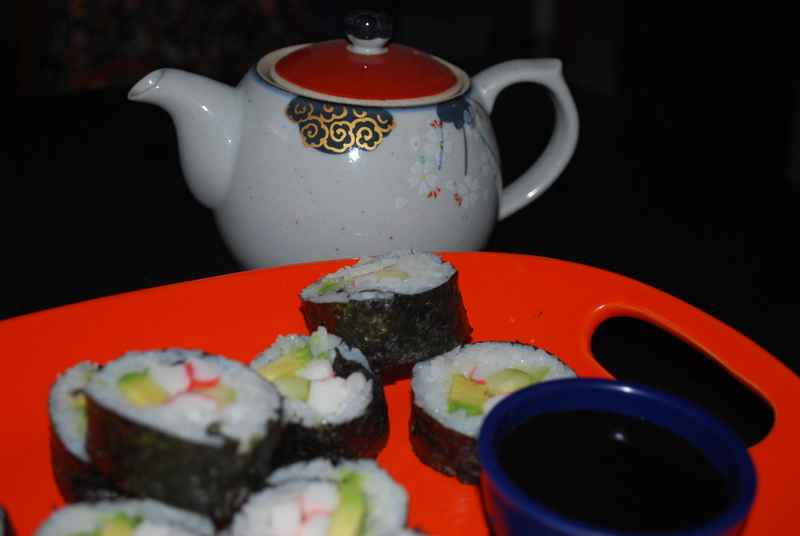 If your knife is sticking to the sushi, making it hard to cut, wet your knife with warm water in between cuts. And that’s it! It looks very impressive but it’s not hard at all! The best part is that it’s sooooo much cheaper making it yourself than getting it from a restaurant. 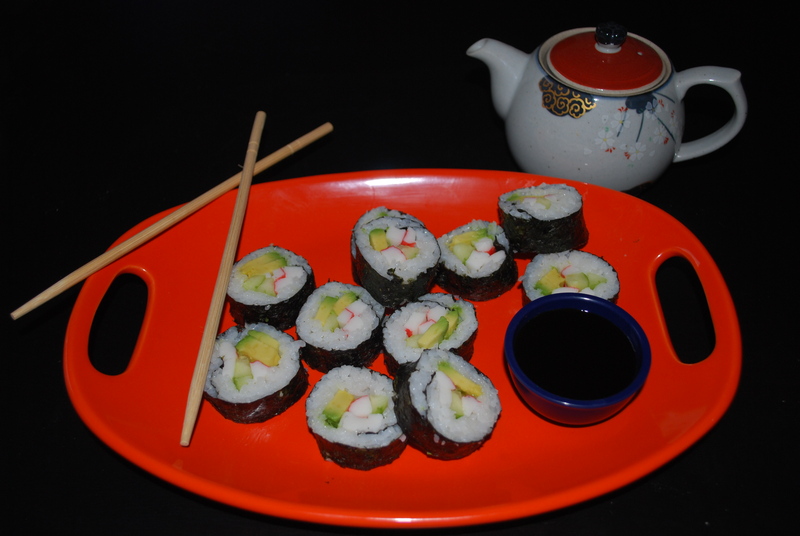 Since my California Rolls turned out so wonderfully, I think I’ll give Philadelphia rolls or other types of sushi a try soon. 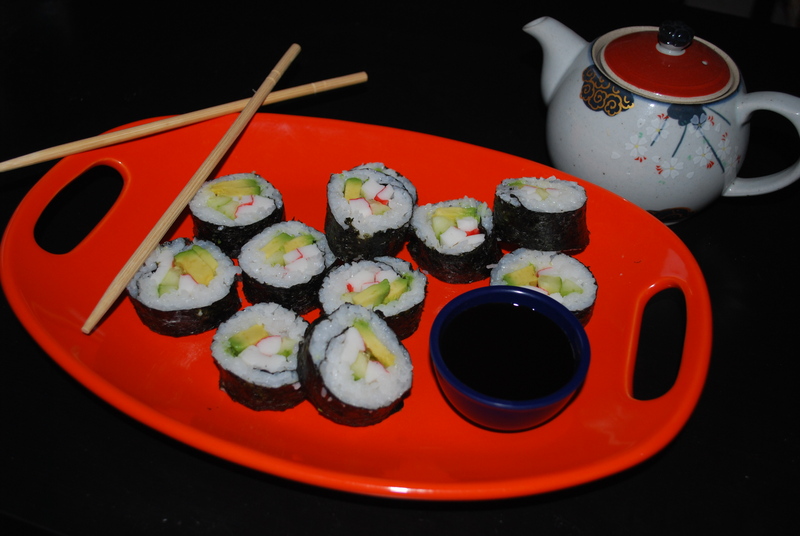 This entry was posted in Appetizers, Asian Inspired Food, Dinner, Lunch and tagged avocado, California rolls, crab, cucumber, rice, sushi. Bookmark the permalink.